As seen in the previous section Query the artifacts, retrieving information is done through GET requests while update operations are done through POST, PUT, PATCH or DELETE requests. The difference between PUT and PATCH is minimal. Usually the PUT takes the whole resource as arguments, whereas the PATCH takes only what need to be modified. Usage of PUT vs PATCH will depends on the route. To update an artifact we have to provide an artifact representation (take the one coming from the GET /artifacts/:id as an example) with updated values. Remember that you can get the id of the fields and values by getting the structure of the tracker thanks to the route trackers/123. 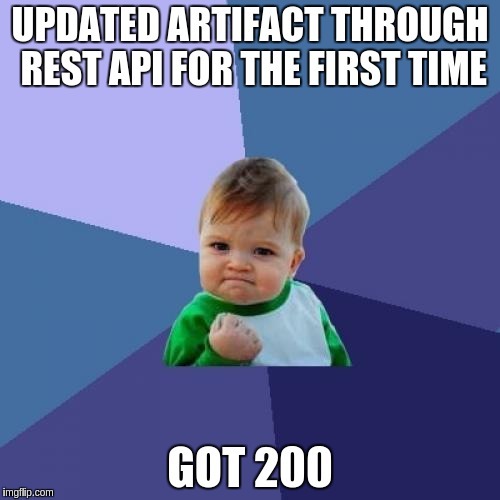 The server returned a 200 status code, meaning that the artifact is successfully updated. That’s it! You have most of the resources needed to use the various REST routes provided by Tuleap. We strongly suggest that you use the API explorer (https://tuleap.example.com/api/explorer/) which documents all the routes and let you try them on the fly without having to manage an authentication token or type a curl command. It’s the end of this REST API Quick Start, you can now use your favorite programming language to enhance Tuleap capabilities.